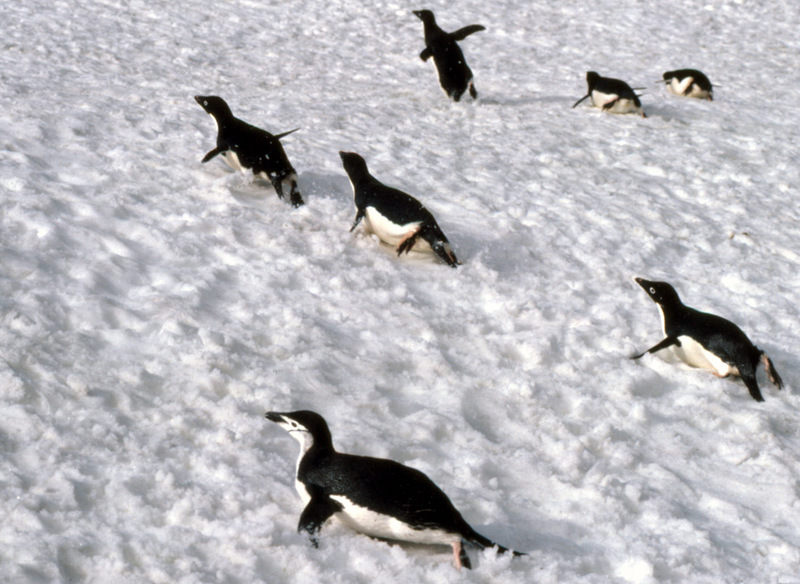 Tobogganing Adelie penguins (and a lone chinstrap at the front). All types of penguin that come across snow and ice can and will toboggan in this manner. It is a very efficient and rapid way of moving when the conditions are right - soft snow, but where the penguin only sinks a little way into it, needing less energy than walking the same distance. The penguin lays on it's front and pushes its way forwards using its feet, the flippers are used for balance or sometimes as oars to help forwards movement. A considerable speed can be reached for short distances in this way, enough to out pace a running man.